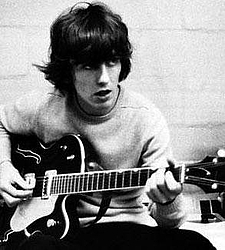 George Harrison, MBE (25 February 1943 – 29 November 2001) born in Liverpool, UK, was an English rock musician, singer-songwriter and film producer who achieved international fame as lead guitarist in The Beatles, along with mainstream success as a solo artist. George contributed to the songwriting talents of his Beatles band mates, John Lennon and Paul McCartney, firstly by adding ideas and guitar parts, and later with his distinctive style of music inspired by Eastern spirituality. After the Beatles stopped touring George started writing more songs than could be fitted onto the albums so by the time of the split he had built up a collection songs, some used on his debut solo album, All Things Must Pass. The album, released in 1970, contains the two-time number one hit, My Sweet Lord. Harrison is also credited for creating music benefits, notably the 1971 Concert for Bangladesh. Harrison played beside Bob Dylan, Eric Clapton, Billy Preston, Ringo Starr, and Leon Russell to a crowd of 40,000 in Madison Square Garden, New York. The show raised over $240,000 benefiting the George Harrison Fund for Bangladesh relief. Harrison went on to release several successful solo albums, and in the late 1980s collaborated with Bob Dylan, Jeff Lynne, Roy Orbison, and Tom Petty, in a group called Traveling Wilburys. The group released two albums. Harrison died on November 29, 2001 after a battle with cancer, leaving behind a wife and son, Olivia and Dhani Harrison. His last album, Brainwashed, was released posthumously and featured the single Any Road. A benefit concert in Harrison's memory was played on November 29, 2002 at the Royal Albert Hall. The star-studded event (featuring Eric Clapton and Monty Python, as well as former band mates Paul McCartney and Ringo Starr) was released on the DVD double-album, The Concert for George. Subscribe to George Harrison RSS Feed to get latest lyrics and news updates. What do you think about George Harrison? Let us know in the comments below!